Designing Curtains for Living Rooms – one of the most widely used rooms in a home, we can design your living room curtains using bright colours with vivid patterns or we can go for subtle and sophisticated pastel colours and simple patterns. Designing Curtains for Boudoirs – requirements of looks and functionality guide us as we come up with unique and appealing bedroom curtain designs for you. Designing Curtains for Kitchens – Made from lovely shades of light greens and light yellows that not only brighten up your kitchens, our kitchen curtains also help in making your kitchens look hygienic and clean, and bring inspiration to your cooking as well! Designing Curtains for Bathrooms – Full length bathroom curtains are ideal for surrounding your showers and bath tubs to protect against water spills, provide privacy, add to the aesthetic beauty and make your bathrooms look stylized, modern, classy and chic. Designing Curtains for Offices & Business Places – Giving your business place the ‘Corporate’ look; we will use sophisticated colours for designing your office curtains. We can also design them to match with the theme of your business. Lining requirements as specified by you. Attractive curtain tiebacks that hold back your curtains gently allowing you to view the outside world in style. 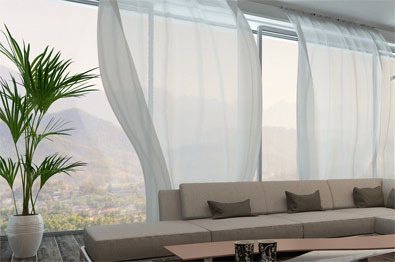 Our services of installing curtains include installation of curtain rods if you do not already have them. We make sure to make as minimum of a mess and be in and out of your office or home without you even knowing it! How your curtains finally look in your rooms depends a lot on how well they have been installed. Poor alignment or poor panel setting completely ruins the look of your curtains regardless of how well they have been manufactured. Therefore, our team of experts will make sure that once they are through installing curtains, the final look will leave you mesmerized and in awe! Our installation team will do a check-list run-up to make sure that all your curtain requirements are met and that you are provided with curtains that meet your exact requirements. They help in maintaining the room’s atmosphere by providing the right level of insulation so you can enjoy serenity in your rooms. Curtains add to the aesthetic beauty of your rooms and provide functionality – as long as they are well maintained and in proper working condition that is! As your curtains grow old, with the regular wear and tear, or for some other reason, they might require repairing. Curtains that do not open and close properly, have torn fabric, worn down curtain rods, misplaced lining, etc., become a nuisance. It is best to get them repaired on priority. But you must handover the job of repairing your curtains to an expert like PJ Curtains and Blinds. As experts in our field, we have the professional expertise and experience required for repairing your curtains to make them look as good as new. Once we are through, you will not even be able to discover the area that was repaired because we make sure to do the finest quality curtain repairing job in Melbourne! Whatever your requirement may be, our window covering solutions are one of the finest in Melbourne. We are sure that our window covering solutions are sure to not let you down. With an experience of over a decade and a team of professionals, PJ Curtains and Blinds are your destination of choice in Melbourne for all types of window covering solutions including top quality curtains and blinds!